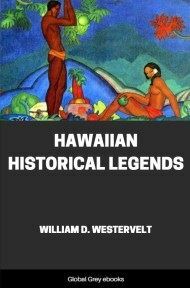 This is a collection of lore related to the Polynesian culture-hero, Maui, particularly his labors in creating the world. 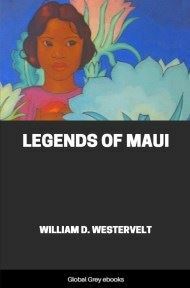 The book also includes some myths about Hina, Maui's mother, and several tales local to the Hawaiian islands. FOUR BROTHERS, each bearing the name of Maui, belong to Hawaiian legend. They accomplished little as a family, except on special occasions when the youngest of the household awakened his brothers by some unexpected trick which drew them into unwonted action. 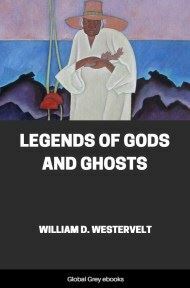 The legends of Hawaii, Tonga, Tahiti, New Zealand and the Hervey group make this youngest Maui "the discoverer of fire" or "the ensnarer of the sun" or "the fisherman who pulls up islands" or "the man endowed with magic," or "Maui with spirit power." The legends vary somewhat, of course, but not as much as might be expected when the thousands of miles between various groups of islands are taken into consideration. Maui was one of the Polynesian demi-gods. His parents belonged to the family of supernatural beings. 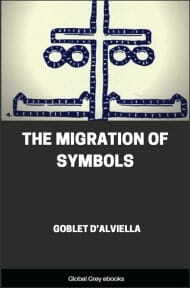 He himself was possessed of supernatural powers and was supposed to make use of all manner of enchantments. In New Zealand antiquity a Maui was said to have assisted other gods in the creation of man. Nevertheless Maui was very human. He lived in thatched houses, had wives and children, and was scolded by the women for not properly supporting his household. The time of his sojourn among men is very indefinite. In Hawaiian genealogies Maui and his brothers were placed among the descendants of Ulu and "the sons of Kii," and Maui was one of the ancestors of Kamehameha, the first king of the united Hawaiian Islands. This would place him in the seventh or eighth century of the Christian Era. But it is more probable that Maui belongs to the mist-land of time. 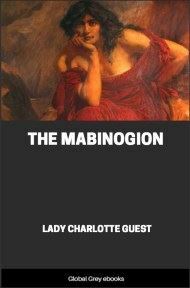 His mischievous pranks with the various gods would make him another Mercury living in any age from the creation to the beginning of the Christian era. 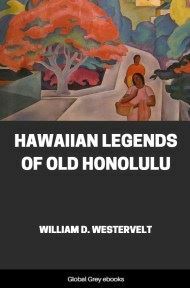 The Hervey Island legends state that Maui's father was "the supporter of the heavens" and his mother "the guardian of the road to the invisible world." In the Hawaiian chant, Akalana was the name of his father. In other groups this was the name by which his mother was known. Kanaloa, the god, is sometimes known as the father of Maui. In Hawaii Hina was his mother. Elsewhere Ina, or Hina, was the grandmother, from whom he secured fire. The Hervey Island legends say that four mighty ones lived in the old world from which their ancestors came. This old world bore the name Ava-iki, which is the same as Hawa-ii, or Hawaii. The four gods were Mauike, Ra, Ru, and Bua-Taranga. It is interesting to trace the connection of these four names with Polynesian mythology. Mauike is the same as the demi-god of New Zealand, Mafuike. On other islands the name is spelled Mauika, Mafuika, Mafuia, Mafuie, and Mahuika. Ra, the sun god of Egypt, is the same as Ra in New Zealand and La (sun) in Hawaii. Ru, the supporter of the heavens, is probably the Ku of Hawaii, and the Tu of New Zealand and other islands, one of the greatest of the gods worshiped by the ancient Hawaiians. The fourth mighty one from Ava-ika was a woman, Bua-taranga, who guarded the path to the underworld. Talanga in Samoa, and Akalana in Hawaii were the same as Taranga. Pua-kalana (the Kalana flower) would probably be the same in Hawaiian as Bua-taranga in the language of the Society Islands. Ru, the supporter of the Heavens, married Buataranga, the guardian of the lower world. Their one child was Maui. The legends of Raro-Toaga state that Maui's father and mother were the children of Tangaroa (Kanaloa in Hawaiian), the great god worshiped throughout Polynesia. There were three Maui brothers and one sister, Ina-ika (Ina, the fish). The New Zealand legends relate the incidents of the babyhood of Maui. Maui was prematurely born, and his mother, not, caring to be troubled with him, cut off a lock of her hair, tied it around him and cast him into the sea. In this way the name came to him, Maui-Tiki-Tiki, or "Maui formed in the topknot." The waters bore him safely. The jelly fish enwrapped and mothered him. The god of the seas cared for and protected him. He was carried to the god's house and hung up in the roof that he inight feel the warm air of the fire, and be cherished into life. When he was old enough, he came to his relations while they were all gathered in the great House of Assembly, dancing and making merry. Little Maui crept in and sat down behind his brothers. Soon his mother called the children and found a strange child, who proved that he was her son, and was taken in as one of the family.